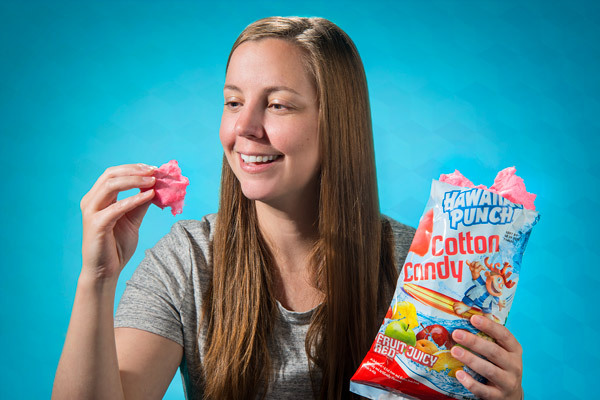 Hawaiian Punch Cotton Candy: Fruit-flavored airy sugary snack. Hey, how about a nice Hawaiian punch? Bam! The delicious Fruit Juicy Red flavor of Hawaiian Punch drink is now available as tasty cotton candy! The tropical tutti-frutti taste of a childhood favorite combined with the light, airy texture of a county fair staple creates a combination that tastes like a right-cross of flavor to your taste buds! Hawaiian Punch is the fruity drink that's been giving kids red moustaches for generations. Cotton candy is the spun sugar treat that's made kids go wild for over a century. Hawaiian Punch Cotton Candy combines these flavorful favorites in a 1-2 combo that'll knock your socks off. Sweet, fruity, light, and airy, Hawaiian Punch Cotton Candy gives your tastebuds a tropical rope-a-dope. It's a luau in your mouth. 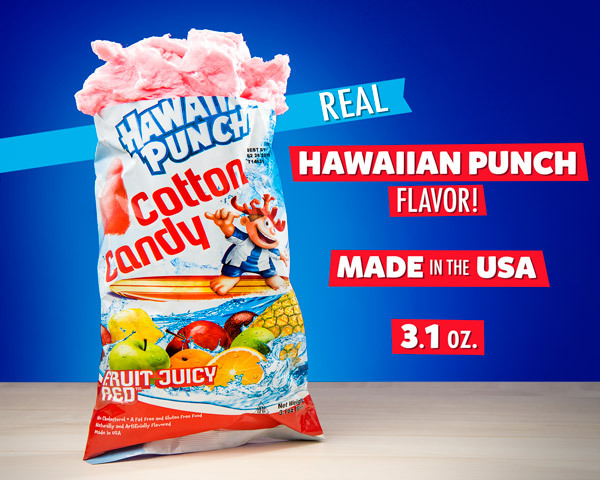 Each bag of Hawaiian Punch Cotton Candy boasts over three ounces of fluffy stuff that's flavored with the Fruit Juicy Red flavor you'd find in the drink. The combination of apple, apricot, guava, orange, papaya, passion fruit, and pineapple taste infused in American-made candy floss is a treat your tongue won't soon forget. As American as pineapple pie. Question: Exactly how much does it taste like Hawaiian Punch? Answer: It's a perfect 10/10, since it's officially licensed with the exact same flavorant as the drink. Question: Hey! How 'bout a nice Hawaiian punch? Answer: Yes, if you mean a delicious fruity treat. But if you mean throwing a haymaker at our money makers, we'll have to recommend you vent your frustration responsibly.